If you have forgotten your mobile phone number, you can know it from your SIM card very easily. When you have so many SIMs, you cannot remember each and every number. You may have forgotten it for a moment and you need it for mobile load or to share your number with someone. If you don’t know or have forgotten your mobile number, you can identify it from your SIM. Although you can check it by making a missed call to any other available mobile phone but what if you have not balance? Every mobile network provides some short codes or a SMS service for all such cases. Recently I need to use an old SIM but I haven’t remembered its number. Than one of my friends told me that there are some particular codes for each mobile network to find phone number. When you dial these codes or send message, you will get your phone number. Below are codes for each of the operators. 1. From your phone, dial *100# and then select 2nd option by writing 2. Enter any other active number on which you can receive SMS. You will get an SMS “Please call me back at 0923130000000” on other number which will show your Zong’s SIM number. 2. Text MYNO to 777. Rs. 1.50+tax are charged for each message. Dial *99# and press call button. 1. Send a blank SMS to “7421″ and you will get your SIM number on same mobile in a SMS. 2. 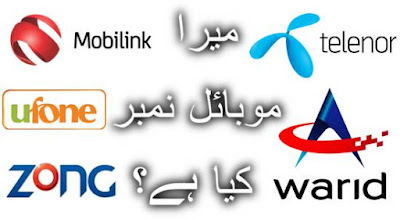 Send SIM serial number (which can be seen at the back side of each telenor SIM which starts with 0060) to 346 by using another Telenor SIM and you will get the number of that specific SIM via SMS on other SIM. In SMS write “MYNO” or “MyNumber” and send it to “6060″ or “321″ you will get your mobile number. Rs 2+Tax per SMS will be charged for this service. You can also find phone number of Android phones. Go to Settings, About Phone, Status, SIM Status and then My Phone Number. In iPhone, your own phone number appears at the very top of your contacts list. It can also be found from Settings, Phone and then My Number. You can not only know your own mobile number but also you can find mobile number of any SIM card.